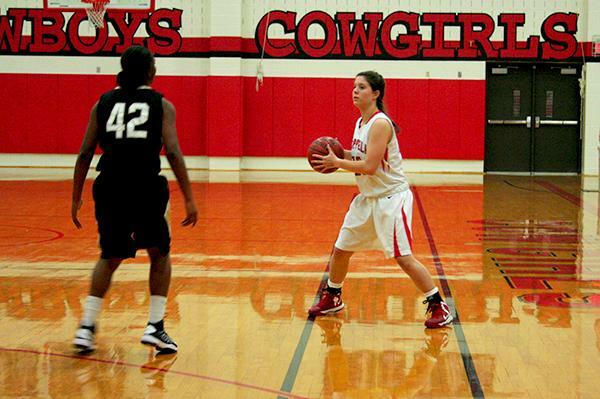 The Coppell Cowboy Girls Varsity basketball team was defeated 58-42 at the by the aggressive McKinney Lady Lions. The loss, in the non-district game, dropped Coppell’s record to 7 and 11 for the season. The Lions jumped out to a quick lead which they never relinquished. The Lions led Coppell 12 to 6 at the end of the first quarter. The Lions displayed their defensive ability, got a turnover and took a 20 to 10 lead with 5:55 left in the half. The Lions then got out fast in their transition game and took a 26 to 14 lead with 1:28 left in the second quarter. As the result of the Lions quickness, the Cowgirls struggled to get back on defense and trailed 30 to 16 at the half. The Cowgirls scored the first two points of the second half when junior post Jaidyn Phillips made a layup with 6:33 left on the clock in the quarter. Both teams traded turnovers, but the Lady Lions were able to increase their lead to 39-26. The Lady Lions then hit back to back three pointers and the Cowgirls trailed 43 to 26 at the end of the third quarter. The Lions displayed a good defense and exhibited great ball movement in the fourth quarter. Midway through the fourth quarter, Coppell got into foul trouble and trailed by 20. McKinney likewise got into foul trouble in the fourth quarter. Junior Post, Jaidyn Phillips, made two foul shots to bring the Cowboys to within 13 points of the Lions. The Lions really became defensive and held Coppell scoreless for the last 1:49 and handed Coppell a 16 point loss. The Cowgirls take on Allen on Friday Dec 21 in Allen High School.